Chitosan is a polycationic natural polymer which is abundant in nature. Chitosan has gained much attention as natural polymer in the biomedical field. The up to date drug delivery as well as the nanotechnology in controlled release of drugs from chitosan nanofibers are focused in this review. Electrospinning is one of the most established and widely used techniques for preparing nanofibers. This method is versatile and efficient for the production of continuous nanofibers. The chitosan-based nanofibers are emerging materials in the arena of biomaterials. Recent studies revealed that various drugs such as antibiotics, chemotherapeutic agents, proteins and anti-inflammatory analgesic drugs were successfully loaded onto electrospun nanofibers. Chitosan nanofibers have several outstanding properties for different significant pharmaceutical applications such as wound dressing, tissue engineering, enzyme immobilization, and drug delivery systems. 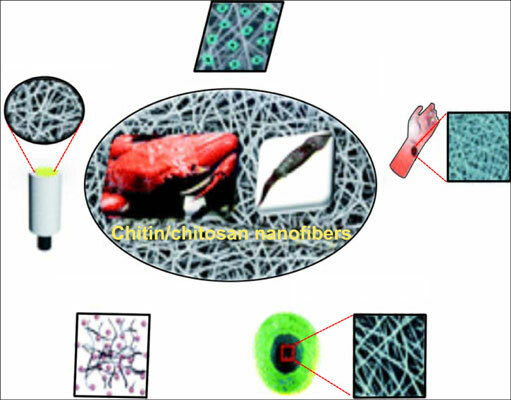 This review highlights different issues of chitosan nanofibers in drug delivery applications, starting from the preparation of chitosan nanofibers, followed by giving an idea about the biocompatibility and degradation of chitosan nanofibers, then describing how to load the drug into the nanofibers. Finally, the major applications of chitosan nanofibers in drug delivery systems. Biomedical applications, chitosan, controlled release systems, drug delivery, electrospinning, nanofibers.